What happened to Charlie Hebdo when their artists were attacked and killed by terrorists for publishing offensive images was a result of "stupidity and lack of vision" on the part of the artists, who provoked their own deaths. 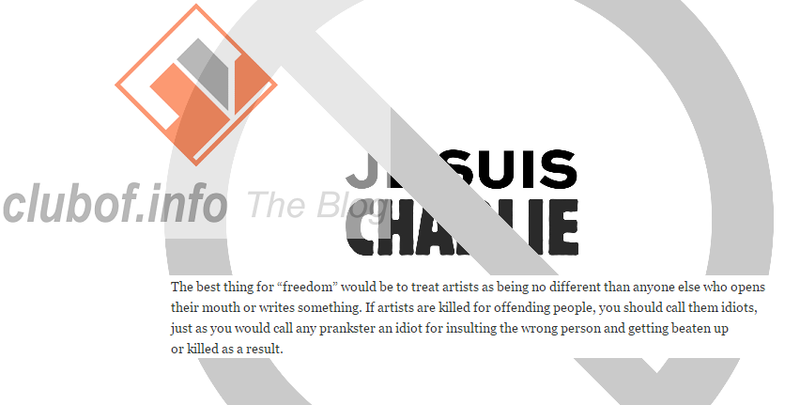 A blog published via the multi-faith Beliefnet website advances, "If artists are killed for offending people, you should call them idiots, just as you would call any prankster an idiot for insulting the wrong person and getting beaten up or killed as a result." The blog writes that the idea of expanding the mandates of free speech to protect any offensive publisher from reprisals by the general public is actually "anti-freedom". It would require security cameras and armed guards everywhere, and for people's opinions to be monitored and suppressed brutally. For example, eight-year-old children were detained and interrogated by police for not supporting Charlie Hebdo in France, yet Charlie Hebdo still pretends to be advancing the frontiers of freedom of speech. In its conclusions, the post asserts that rather than a war on Muslims and further insults against people's religious sensibilities, "People should not be offensive. They should censor themselves for their own safety from everybody else, as the vast majority of people wisely do." The blog notes that "even in the “freest” society imaginable" certain images or statements can go too far and incite members of the public to violence. Much of the media portrays Muslims as exceptionally easy to provoke and prone to violence, while ignoring the violence and oversensitive behavior of other social groups and the fact that anyone else can also be provoked to violence if their feelings are constantly and deliberately being hurt.